Homeostasis, a fundamental principle in biology, is a concept that was developed by Claude Bernard during the 1850s and expanded upon and popularized by W. B. Cannon during the 1920s to1930s. It is the process by which a living being maintains a constant internal environment when its external environment is changing. Negative feedback control systems, whether in biological or nonliving systems, consist of three integral components: a receptor that detects changes in the system; a control center that compares the change with a set or reference point, which in biological systems are the normal values; and an effector, which initiates appropriate action to return the system to its reference point. By analogy, consider the home furnace and thermostat. In 1885, Albert Butz invented the earliest functional thermostat. The furnace continues to heat the facility until a set temperature is detected by the thermostat, which shuts the furnace down and then turns it on when the facility’s temperature falls below the set temperature. Many endocrine systems, such as blood glucose levels, are linked to control centers by homeostatic negative feedback mechanisms that operate in a cyclical and continuous manner. After eating a carbohydrate-rich meal, blood glucose levels rise, stimulating the release of insulin from the beta cells of the pancreas. Glucose enters body cells, and the liver takes up the excess sugar, which it stores as glycogen. Blood glucose levels are detected and compared with set levels (70–110 mg glucose/100 ml blood). If levels are too low, insulin secretion stops and glucagon is released from the alpha cells of the pancreas stimulating the breakdown of liver glycogen to glucose, which is released in the blood. Negative feedback inhibition also controls the amount of final product that is synthesized in many enzyme-catalyzed biochemical pathway reactions. After an optimal amount of end product is formed, the end product reacts with an enzyme in the pathway, interfering with synthesis of additional compounds. SEE ALSO: Metabolism (1614), Homeostasis (1854), Enzymes (1878), Thyroid Gland and Metamorphosis (1912), Insulin (1921), Progesterone (1929), Second Messengers (1956), Energy Balance (1960), Hypothalamic-Pituitary Axis (1968), Cholesterol Metabolism (1974). 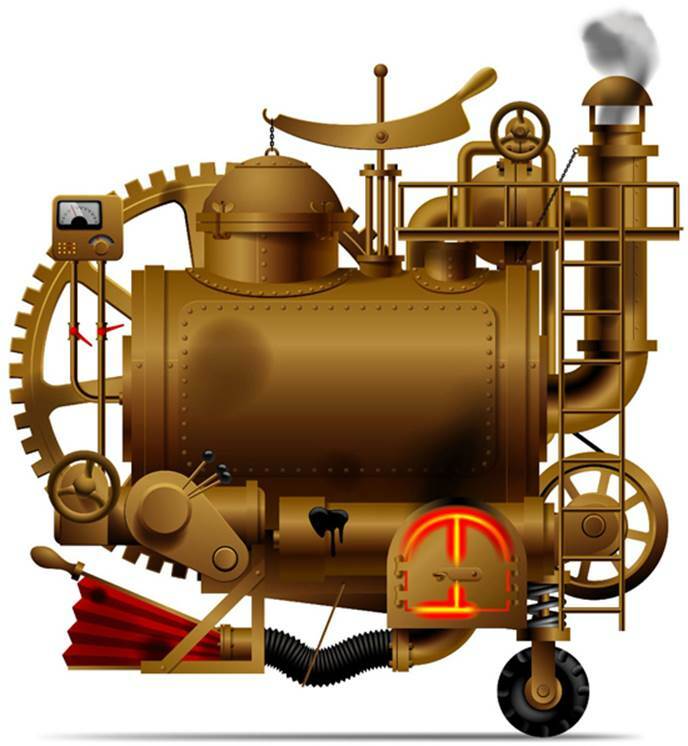 An illustration of a complex machine with a steam boiler, gears, levers, pipes, meters, furnace, flue, and presumably a thermostat to provide a negative feedback loop that will keep the temperature of the machine at a reasonable level.